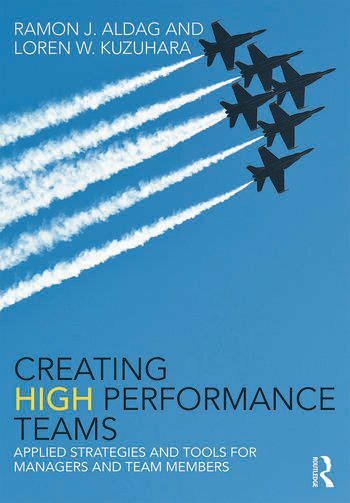 Creating High Performance Teams is an accessible and thorough new introduction to this key area of business education. Written by teams experts Ray Aldag and Loren Kuzuhara, this book provides students with both a firm grounding in the key concepts of the field and the practical tools to become successful team managers and members. Built on a solid foundation of the most up to date research and theory, chapters are packed with case studies, real-world examples, tasks and discussion questions, while a companion website supports the book with a wealth of useful resources for students, team members, and instructors. With its combined emphasis on principles and application, interwoven with the tools, topics, and teams most relevant today, Creating High Performance Teams is perfectly placed to equip upper-level undergraduate and MBA students with the knowledge and skills necessary to take on teams in any situation. Ramon J. Aldag is a professor in the Department of Management and Human Resources at the Wisconsin School of Business. He holds the Glen A. Skillrud Family Chair in Business. Loren W. Kuzuhara is a teaching professor in the Department of Management and Human Resources at the Wisconsin School of Business.